Q: How do I add another colleague or individual to a conversation? 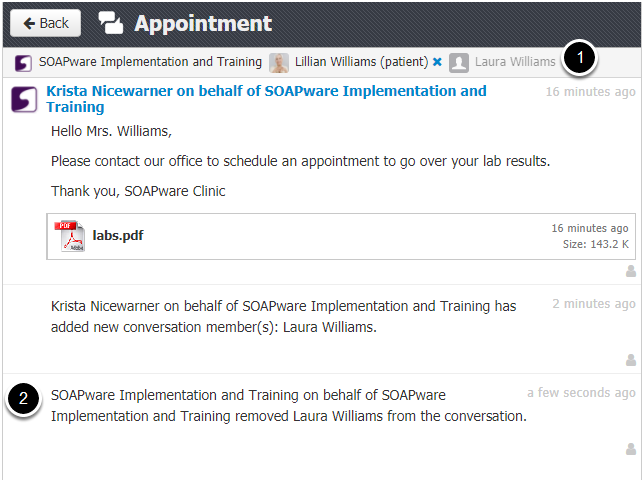 If you wish to send a conversation on behalf of your clinic to a colleague or individual, ensure that you have the clinic selected from the "You are acting as" drop-down. Enter the individual(s) you would like to be a part of this conversation by typing a few letters of his or her name. This will bring up a matching name from within your My Connections list, that you can select from. Multiple recipients can be added to your new conversation. Fill out the remainder of the information as desired. To add recipients to an existing conversation, open the conversation, then click the Add People button under the Actions panel. Enter the individual(s) you would like to be a part of this conversation by typing a few letters of his or her name. This will bring up a matching name from within your My Connections list, that you can select from or click enter on your keyboard. 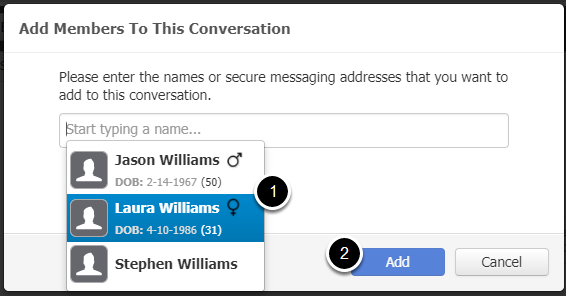 Multiple recipients can be added to your new conversation. 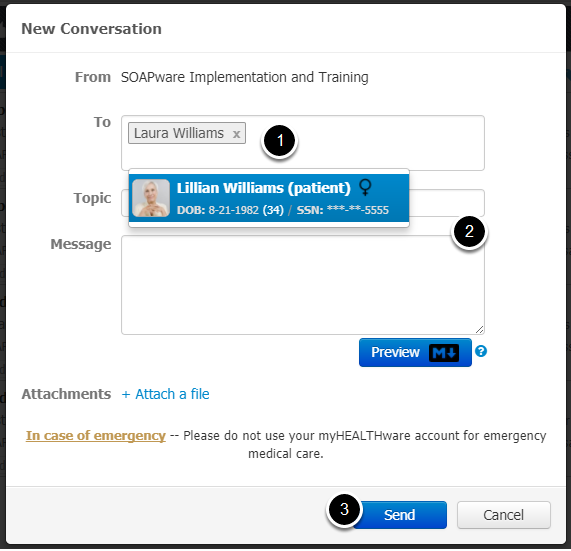 *Note: You can only send a new conversation to users that you have as a Contact and are connected with in myHEALTHware. The new recipient has been added to your existing conversation. They will now be able to view any additional messages that are added as a part of the conversation. They will not be able to view messages that were included in the conversation prior to them being added as a recipient. Click the X icon located to the right of the user that you wish to remove. *Note: Currently, the user who is the originator of a conversation is given administrative rights to then remove recipients from the conversation. Users who were added to a conversation will not have administrator rights and will not have the ability to remove recipients from a conversation. The recipient who was removed will be grayed out in the recipients bar located at the top of the conversation. Events will be recorded to indicate that the recipient left/was removed from the conversation.